Hopefully most of us in this community understand that many of the plants we love to grow are becoming progressively more scarce and endangered in their wild populations due to improper land management, pollution, development, and poaching, among other issues. There are several organizations that have taken on the responsibility in trying to fight these issues and protect the land and ecosystems that rare plants and animals depend on. 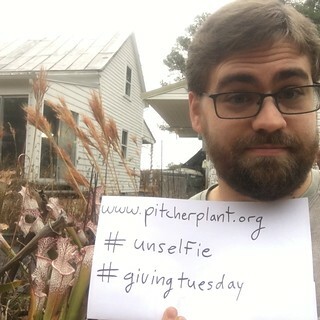 Here at Meadowview Biological Research Station, we have taken a targeted approach to preserve and restore pitcher plant and longleaf pine ecosystems in our neighborhood of Virginia and Maryland. We have made big strides as an organization in improving and increasing our infrastructure, trained staff, and equipment required to advance our cause and do the work that we do; but there are still ways we want to improve, and succeeding as a non-profit is expensive! We require continued support to do the work that we do and improve our organization. After a weekend of potentially intense shopping, Giving Tuesday has become a tradition to remind us that this is also a season for giving; a reminder to focus on more than material goods. On this Giving Tuesday we hope you will consider us in your holiday philanthropy. Happy holidays, and good growing!